The Thabo Sefolosha story is about much more than just basketball. The Atlanta Hawks guard is the son of a South African father and Swiss mother who weren’t accepted in either country after their nuptials in the 1980s. Sefolosha got into fights while growing up in Switzerland with kids who had a problem with his mixed racial makeup. And on the morning of April 18, 2015, the first Swiss NBA player was arrested by police officers who fractured his right tibia outside a New York City nightclub. Sefolosha, 32, has played for the Hawks, Oklahoma City Thunder and Chicago Bulls during his 11-year NBA career. On Tuesday, the 6-foot-7, 220-pounder’s focus wasn’t just on hoops as he talked about how racism affected his family, his painful bout with the New York City police, Colin Kaepernick, Danny Ferry and other social issues in America during an interview with The Undefeated. Can you briefly tell the story of your mother and father and what they went through? My mom is a Swiss lady, born and raised in Switzerland. And, she moved to South Africa with her then-husband. And, they got a child together, divorced. Then my mom stayed in South Africa for a while, and she met my dad. Back then in South Africa — my dad being a native black guy, my mom being white — with apartheid it was impossible for them to be together and everything. They went through a whole lot. My dad being arrested, and just everything you could think of about apartheid. They lived it. My dad being from a township in South Africa. A musician traveling, and then my mom got pregnant with my older brother. And, at the time, they decided raising a mixed baby in that environment wasn’t healthy. It wasn’t good. They moved back to Switzerland. What were some of the bigger nightmares that they faced being a mixed couple in South Africa at the time? It was very different for both of them. For my mom, it was probably tough to be the ‘privileged’ one in a way, and seeing things she had never seen in Switzerland. Just the racism as a way of society. Just the separation and everything. After a while it really got to her that it was just too crazy, you know? It was too much. And for my dad really it was not being free to do what he wanted to. You want to date a white girl and not be a criminal for it. You went to jail for it. The neighbor calling the police saying, ‘Hey, there’s a black guy at this house, come and get him because he’s in this neighborhood.’ It was probably very tough. They both wanted that relationship to work and decided to go to Switzerland. Anything you remember in particular about what your parents went through when you were young? I was born in Switzerland. I remember the time in Switzerland. It was early to mid-’80s that they moved back to Switzerland. For me growing up, my dad was one of the first black guys that was in Switzerland. You know, there are a lot of second-generation and mixed children, and everything. But back then it was a rarity. My dad was a black man with dreadlocks, a musician, bringing some people from South Africa to do the music. What kind of musician was your father? He plays the drum, the saxophone, and he sings. He had a band back then in South Africa that was pretty popular. They did songs with Virgin Records, and they were touring. They came to the U.S. to tour, and all that. So, he was really into music and people looked at him like an alien. He didn’t speak French at first when they moved to Switzerland. It was a tough time. It was tough for him, it was tough for my mom and stuff for the family for a lot of years. Do you remember how your mom was treated? She went back to the house that she grew up in when she came back to Switzerland. The neighbors and people looked at her like, ‘What are you doing? What is this type of life that you’re choosing for yourself?’ She didn’t care. She wanted to be with my dad and that’s what she decided to do. How did your parents’ experience shape you? Everything that people go through as kids, as teenagers, everything shapes you in many different ways. I try to put my finger on it and say, ‘This is what made me be who I am today.’ But, all of it definitely shaped me. The things that I went through, with school, being one of the first, or the only black guy, in my whole school and stuff like that, all of that shapes you. Did you get teased at all as a kid? Yeah, just a little. Again, racism is stupidity. So if you’re the only black guy, you’re a target in a way. I was a little taller than a lot of them so, they did less right in front of my face. You hear stuff. You understand stuff and, you’re definitely not happy with it. For a lot of years, I was getting into fights when I was young. What do you remember about your arrival to America, and what was your dream when you were drafted with the 13th overall pick during the 2006 NBA draft in New York City? The very first time I came to the U.S. was a month before the draft. And the U.S. was just, ‘Wow,’ to me. I traveled from place to place [for pre-draft workouts], and the first thing that struck me was the size of things, buildings, cars, people. That’s what I remember of America. Thabo Sefolosha, a guard of Switzerland, walks to the stage after he was chosen by the Philadelphia 76ers as the 13th overall pick of the 2006 NBA Draft Wednesday June 28, 2006 at Madison Square Garden in New York. 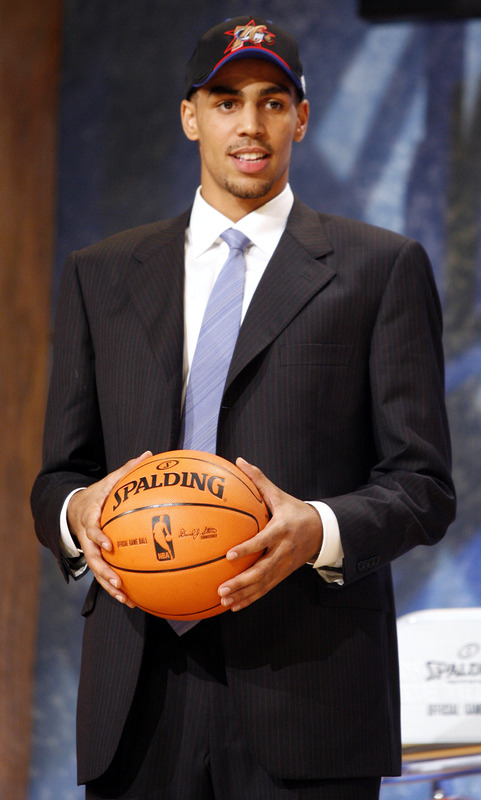 Sefolosha was then traded to the Chicago Bulls. And then when I moved to Chicago, the thing that I really found interesting is, how people live separate lives. Black people one side. The white people on one side. The Latinos on one side. And, they barely mixed. So, I thought that was something different. Did it stun you that Chicago and America were that way? A little bit, because when you hear about America, and you’ve never been to America, you know the pride of being, ‘The land of the free … ’ Everybody loves each other and this and that. All the racism is a thing of the past. So, you start living here and understanding a little bit of dynamic of things, yeah, it was surprising. To me, it felt more segregated in Chicago than Oklahoma City. I had a very good friend of mine there that played in Europe. I knew a mixed couple also in Oklahoma City. People don’t talk a whole lot about the world and stuff like that there. You got different views of the world. But, other than that, people are really nice. I have nothing bad to say about Oklahoma City. The people are really nice. It’s a small place. We met some people that were great people, good-hearted people. And, you know till this day we have them as friends. But every place has their good parts and bad parts. There’s things that I read afterwards about Tulsa and stuff like that. I know the history there is pretty deep and not all good. But, when I was [in Oklahoma] it felt good. It felt good, a good place to raise a family in many ways. Did you ever go to the Black Wall Street Museum? I didn’t. And, I wish I did, so that is exactly the stuff I read about afterwards, yeah. What do you think of the story about the Tulsa race riots? Crazy. If you read deep into all that, it’s crazy … I watched a little bit of that 13th, the [Netflix] documentary and stuff like that. It all goes hand in hand, and it’s most rigged, you know? The history that they tell you at school and all this, it’s almost propaganda in a way. It’s like, ‘We forget about this … Don’t talk about this.’ We are the ‘land of the free’ and this and that. And, a lot of it is almost a lie to me. How much do you think about that night in New York when you had your incident with the NYPD? It often comes back. Either in conversation or me just thinking about it. It’s not something that’s pleasant to think about. Do you have any nightmares or mental pain that still come up? Anything that you wish you did differently? Anything that you are still stunned by that they did? Yeah, I’m still stunned about what they did. That was uncalled for. It wasn’t the police just doing their job. It was one guy taking advantage because he has a badge. He feels like he’s on top of the world, and you have to listen to him. It wasn’t about upholding the law, nothing like that. It was somebody making their own law and telling you what they wanted you to do. It’s bad. All that was very bad. And I’ve answered that question before. If there’s anything I would do differently, sadly yes. 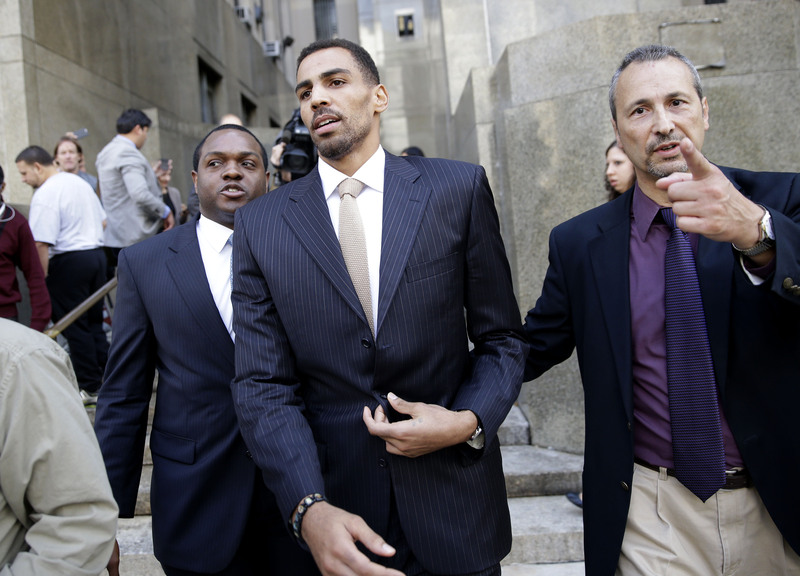 Thabo Sefolosha, center, leaves criminal court in New York, Friday, Oct. 9, 2015. The Atlanta Hawks’ player was acquitted Friday in a case stemming from a police fracas outside a trendy New York City nightclub. You fought it and won the lawsuit against you. You could have probably gone and done some community service and it could have been over with beforehand. Why did you fight it? It didn’t feel right at all. I didn’t do anything wrong that day. And to me to say, ‘It’s nobody’s fault. Let’s forget about what you do one day.’ Why do I have to do one day of community service when I didn’t do anything wrong? I got my leg broken. And they want to put everything under the rug and say, ‘Nothing happened.’ I didn’t feel comfortable at all about that, and I decided that I definitely wanted to go further and try to have somebody be responsible for what happened. What is the greatest victory you’ve ever had in sports? Going to the Finals. That’s it. Or even being drafted, actually. Actually, yeah, getting drafted. Was winning that case against you by the NYPD a bigger victory? I got that out of the way, I’m happy about this. But it still left a bad taste in my mouth. And, the real victory is to have the people that are responsible be really held accountable for it, because I see a pattern. And that’s such a big problem that I see. About the whole police brutality and all this. There’s not accountability for it. What’s the latest in your civil lawsuit against the NYPD? We started a civil lawsuit against the police individually. So, we’ll see where that takes us, but I think it’s good to stand up for what you believe in. And, that’s what I wanted to do and again. I wish there was accountability from the police. What do you think should happen to those policemen? Well, if you ask me, I think somebody that’s going to think they are above the law and they have a badge and a gun, it can be — and has been — deadly for some people in terrible ways. Either go through training, better training or for some people who do stuff like that they shouldn’t be police officers. It’s too much responsibility being in that situation, and I think it’s maybe not meant for everybody. Do you remember your emotions when the verdict came in exonerating you? I was relieved. I was going through a whole lot before with me coming back from the injury. I had to fight to come back as best as I could. I didn’t have the whole summer to train. It was preseason. That preseason required the training and practice, the preseason games and everything that was on my mind. Then at the very same time deal with what was going on in New York. There were a lot of sleepless nights at that time. The Atlanta Hawks’ Thabo Sefolosha Thabo Sefolosha hugs a child before entering criminal court after a lunch break in New York, Thursday, Oct. 8, 2015. An NBA head coach has testified that the character of Sefolosha, a professional basketball player and Swiss national on trial after a confrontation with New York City police, is “of the highest order.” The case stems from a struggle outside the 1Oak nightclub in Chelsea after Indiana Pacers forward Chris Copeland and two women were stabbed. Who were your biggest supporters? My family, wife, mom, dad, brothers and sisters. Everybody was trying to be close and just keeping positive. But some things you kind of go through by yourself. So, all the talking and everything was good. But, really I felt like it was just me and [my attorney] Alex Spiro going through the system. What kind of support did the Hawks give you? Great support. The culture is great. Wes [Wilcox], the GM [general manager], was great. From the very start they believed what I said, and they knew that I didn’t do anything wrong. And they said, ‘OK, whatever time you need, whatever you need us to do …’ When I was going to trial, they had two coaches with me so I could keep training, take my mind off things. They’ve been perfect as far as just supporting me through the whole thing. If you were an American, would this have been reported differently by the media? Would more attention have been paid to it? Being an NBA player, you would think this would have been a major story? What’s your rap sheet? How many times have you been arrested previously? So do you think that because you are a black athlete, perhaps you’re not given the benefit of the doubt? Yeah, I think, in a lot of ways. For a good reason, people see police as being the good people, you know. So, when something like this happens — even in a lot of cases where people get beat up or die or whatever — they think maybe they got what they deserved. Even the guy [Terence Crutcher] in Oklahoma, maybe he was a bad guy. He listened to the police. What more could he have done? So, when you go against the police, you get their version of the story, and it’s always two sides of every story, you know. And now, more than ever, people start to realize it. Have you followed every incident between an African-American male and the police after your incident? In Cincinnati, something happened before the trial and even during the trial. After the trial, I’ve been paying a lot more attention. When I hear something, in a way I’m drawn to the information and try to understand what happened. It’s just a bad situation, and it keeps happening. It keeps happening. You would think, after a while like, ‘OK, let’s find a solution that’s a resolution.’ Holding people accountable is the first step. Everybody talking about training, training, training, and I think you can train people as much as you want. But, if you let them do whatever they want after training, I don’t want to say pointless. It’s a good start, but, you know. Is there any police violence toward African-Americans that happened after you that stood out to you? I’m still shocked by Eric Garner. That’s the one that is crazy. And the one where the guy’s running and the police shoot him in the back, and then put the taser on him, that was somewhere in the South or something like that. Charlotte, [North Carolina] the recent one in Charlotte also. Yeah, it’s been so many. When San Francisco 49ers quarterback Colin Kaepernick came out and protested the national anthem over police brutality against people of color, what did you think? It’s very good. And, you know everybody should be allowed to feel the way they want, first of all, and to speak their mind. It’s great that he’s able to. I know he got a lot of backlash from it, and a lot of people supporting it. I’m definitely someone that supports. 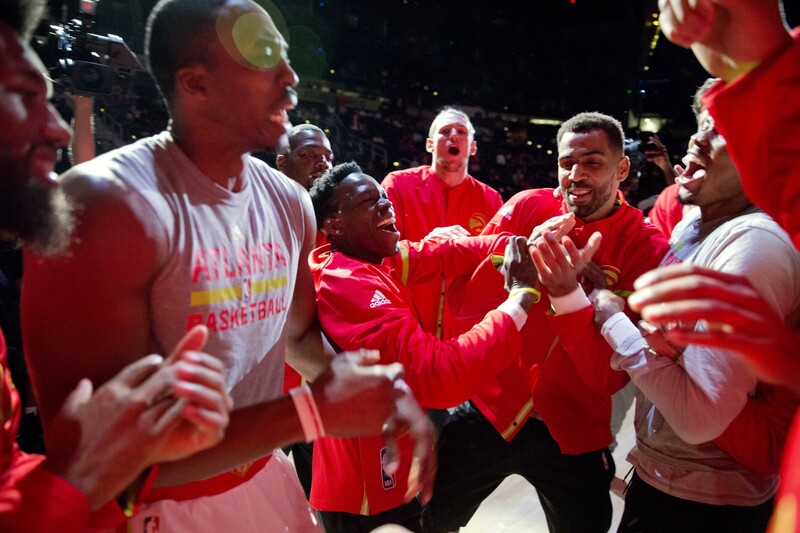 Atlanta Hawks’ Dennis Schroder, center left, Thabo Sefolosha, center right, Dwight Howard, left, and fellow teammates cheer in a huddle before the start of an NBA basketball game against the Sacramento Kings in Atlanta, Monday, Oct. 31, 2016. I haven’t done the same thing. I’m not going to do anything during the anthem or anything like this, but I think he’s doing it and keeping that in the conversation, being somebody that has a lot of media attention. I think it’s a great thing. Why did you decide not to protest The Star-Spangled Banner? Maybe because I’m not American. I want to be respectful to a lot of Americans that I know are great people. And I’d rather have a conversation like this, to sit down and talk about what I see being an issue and what I would like to see change instead of making it a public thing. Correct me if I’m wrong. Did former Hawks president of basketball operations Danny Ferry sign you? What did you think about his situation in Atlanta? Yeah. It’s bad. It makes no sense … To me it’s stupidity. It’s people thinking they are above other people for no reason. I don’t even understand how somebody that played in the NBA, 80, 90 percent of the NBA is black, for him to say things like this, like, who are you? Why? Did you ever get a chance to talk to him about it? No. Because [the incident] happened after I signed and as soon as the comments came out, he got put off the team so … To me, especially in a city like Atlanta, I just don’t understand it, people thinking this way. For me it’s really hard to understand it. Where do you live in the offseason? So, when you retire, you’re probably going to go back to Switzerland? Do you want to be an American citizen? Are you becoming an American citizen? Do your daughters have American passports? One does. Yes. One was born in Chicago. There’s some good things to take from America, and there’s other things that I want to see. I would like my kids to see something different so, I want to go back and have them do their high school years in Switzerland. So, no I don’t necessarily want to be an American citizen, you know. I’m Swiss, I’m South African. How much longer you want to play? How is your body? And, how has your body responded to the broken leg, from the other injuries and does it affect you on a daily basis? Yes, it does. I feel my ankle. I get treatment every day for my ankle. Just to make sure with so many games in so little time. I feel my ankle [pain], so it’s there. It’s just something according to my day-to-day stuff now. And, what I really hope is that it’s not going to bother me more when I’m done playing, and hopefully my life after that. How did you fall in love with basketball? Obviously, soccer and skiing are pretty popular in Switzerland. 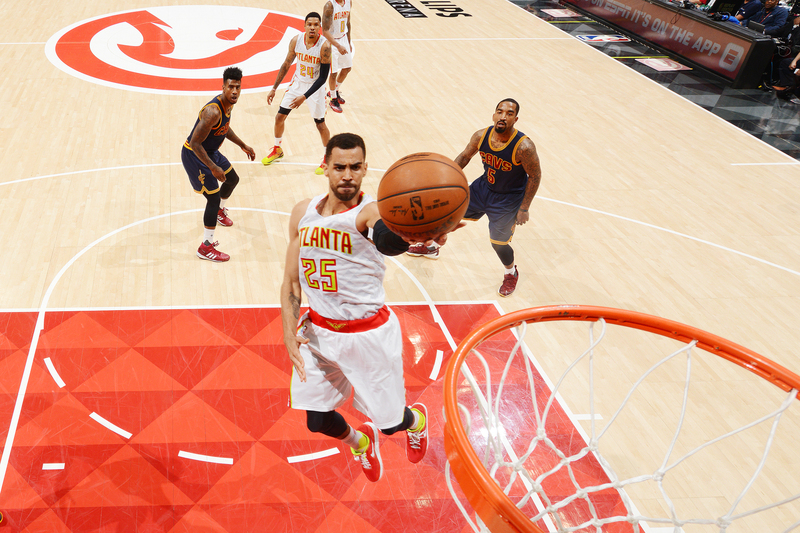 Thabo Sefolosha #25 of the Atlanta Hawks goes up for the layup against the Cleveland Cavaliers during the Eastern Conference Semifinals Game Four on May 8, 2016 at The Philips Arena in Atlanta Georgia. [The USA Dream Team], they were the cool guys. And to me basketball has always been like a beautiful sport. That’s kind of how I discovered basketball and fell in love with it. So what’s your love for basketball right now? The same as when I was young. I love playing. I feel like I’m very lucky. Every chance I have to step on the NBA court, it’s a dream from when I was 10 years old. So, today I’m living it and I’ve been doing it for 10 years now in the NBA. So, it’s a blessing. Are you pretty proud of being the first Swiss guy in the NBA and, if so, why? Very proud of it. My stepdad told me there might be many coming after you and there are going to be some better ones. But, nobody can take away from you being the first one. I may have opened doors for a lot of Swiss players to even believe that it’s possible. Who was your favorite basketball player growing up? Michael Jordan. When I was young in Switzerland, it was hard to find games. They weren’t on TV. There was no YouTube. There was no NBA League Pass, nothing like that. We had some of the coaches that might record a game and we would watch the game 10 times. I still remember I had a game Kobe [Bryant] versus [Allen] Iverson. It was in Philly, and I watched this game probably 20 times. You would watch the game and then you would go on the court pumped up, and try to mimic every move and everything. It was very different for me. That’s why I’m saying I’m proud to be the first one to come out of Switzerland, because I didn’t grow up in a family of athletes. No sports were being played. My dad was a musician. My mom is a painter. Nobody really played sports. So, it was me and my brother, you know. I was very fortunate to have my older brother. We played soccer together. We switched at the same time to basketball, so he got me better just playing 1-on-1, 2-on-2 and 3-on-3. There was no drill. There were no coaches next to us saying, ‘Oh, you should do this, you should do that …’ We were a part of teams also. So, you know, a lot of the coaches that we had were good coaches and they would try to mentor us, but it wasn’t like, you know, we practiced daily shots and this and that. What do you think someone can learn from your story from a basketball standpoint and also from off the court? On the basketball side I’m a strong believer of thoughts becoming things. And, I never stopped thinking that it was possible for me to make it to the NBA. I had a lot of people telling me, ‘You got to stop dreaming. This is just a dream. You got to start another path. It’s never going to work out.’ But, in my mind I never stopped thinking it was possible. I went to France. I went to Italy. It was that I wanted to play in the NBA. When you believe in yourself and make the right moves daily, and good things will happen. I truly believe in that. Off the court, what I hope people can take from what I went through is that don’t place judgment too early when you hear this guy did this, this guy did that, because there’s multiple sides of the story, and I think I’m a good proof of it. Early on, I had a lot comments. People hearing stuff, and saying, ‘Oh, you know, another basketball player got arrested,’ without knowing what happened. And, I think you got to be careful because it’s a problem in America. People got to look at you with an open mind. The police aren’t always doing right, and the good guys in the story.